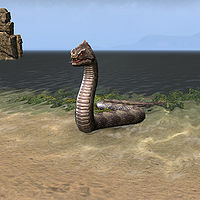 Deathfang is a giant snake that is encountered during the quest Moment of Truth. Dugroth intends to kill it, and enlists your help to accomplish the task. When you approach the snake, however, Dugroth runs away in fear and you have to fight it yourself. This page was last modified on 25 May 2018, at 09:36.